With its impressive cash coffers and reputation for turning out innovative new devices, tech giant Apple (NASDAQ:AAPL) has been at the top of many investors’ buy lists for some time. Even with a $190 price tag Apple stock is a buy. However, over the past few years the company has lost some of its luster as many questioned whether the iPhone would be the firm’s last big hit and if the company could continue delivering returns without another blockbuster device. The iPhone brings in more than half of Apple’s overall revenue, so worries about it’s sustainability are definitely valid. Apple became what it is today because it revolutionized personal devices when it brought out the iPod and then defined smartphones a few years later with the iPhone. Even today, Apple’s iPhone serves as a blueprint for what a smartphone is. However, since that time back in 2007, we haven’t seen another big hit from Apple and investors in Apple stock are starting to get impatient. While I’ll agree that it would be great to see the company come out with another revolutionary device and affirm its reputation as an innovative tech firm, I don’t think the iPhone is going anywhere anytime soon. The fact is that Apple has established an extremely loyal customer base that is willing to upgrade when the company brings out new phones. Apple has built an impressive ecosystem that people are unwilling to leave because all of their devices work together seamlessly. That on its own is innovative and all of the pieces Apple has in place contributes to customer retention. Plus, although we’ve not seen Apple wow the public with a new device in almost a decade, we’ve seen the company put out some pretty solid tech that is performing well. Aside from Apple’s iPad business, which has been on the decline, Apple’s other products are gaining traction- albeit slowly. The Apple Watch is recognized as one of the best wearables on the market and Apple TV has been growing its marketshare as well. Apple’s answer to Amazon’s (NASDAQ:AMZN) Alexa- the HomePod- has had a tepid reception in part because of it’s late entrance to the market, but the firm is keeping up withe competitors by getting it on the market. Add to that the fact that iPhones are still performing well- in the second quarter the number of iPhones shipped was up 3% from the year before and revenue from the devices was up 14%. Much of that revenue spike was due to the phones’ price increase- something that proves Apple customers are willing to pay a premium to stick with the Fruit. All in all, Apple’s business looks solid even without the potential of another blockbuster device. Another big part of Apple stock’s draw is its service business. Sure, Apple isn’t bringing out hot new tech like it used to, but the firm has been focusing on growing its service arm with revolutionary new offerings like Apple Pay. iTunes and the App store have also remained popular and Apple Care and its Cloud services business are also gaining traction. That side of the business is often overlooked by investors, but could be a huge driver for Apple stock in years to come. Not only do all of these services tie customers in to the Apple ecosystem, but they also generate reoccurring revenue for Apple. Moreover, services have much higher margins than hardware. For that reason, growth in AAPL’s service business is a huge part of the reason to pick up Apple stock. Even though Apple has been painted as a tech business past its prime, the company has a great deal of potential ahead. While AAPL stock might not delver the same high-octane growth it once did, the firm’s stability and competitive moat makes it a good pick in the tech space. I think the firm has plenty of growth opportunities in the service space, augmented reality, and even autonomous driving to support impressive returns over the next few years. Not to mention the company’s impressive cash hoard has made the company extremely shareholder-friendly over the past few years, a trend that’s expected to continue. As of this writing, Laura Hoy was long AAPL and AMZN. 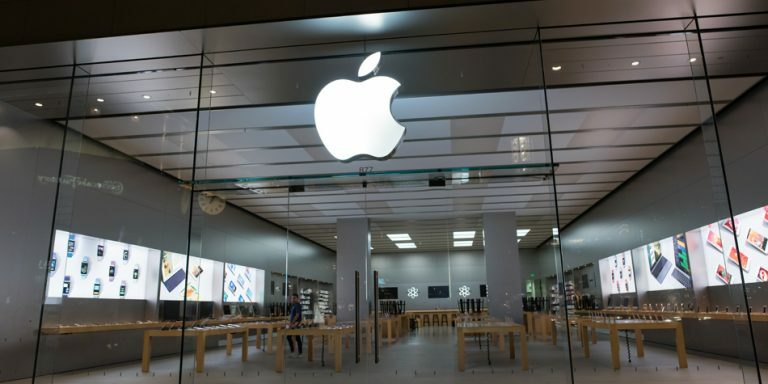 Article printed from InvestorPlace Media, https://investorplace.com/2018/07/apple-stock-buy-current-prices/.